The origin of the people of Kalash or 'Wearers of Black' of Chitral is shrouded in mystery, their tribe has existed for thousands of years having survived in the Hindu Kush range of the Himalayas in the NWFP. They follow a pagan religion, speak an ancient language and possess a culture that is unique in nature. They are also ranked amongst some of the world's most endangered indigenous groups. This summer I received an invitation to visit India which was grabbed with arms wide open. As the plane landed in Delhi my pulse started racing. I was stepping on a land perceived to be inhabited by foes. And yet I was so excited. Talking to the Commonwealth official who received me at the airport, I couldn't help smiling as I looked around taking pictures of ordinary things. Like monkeys on the side road, beggars and trucks, nothing unusual. The origin of the people of Kalash or 'Wearers of Black' of Chitral is shrouded in myst ery, their tribe has existed for thousands of years having survived in the Hindu Kush range of the Himalayas in the NWFP. They follow a pagan religion, speak an ancient language and possess a culture that is unique in nature. They are also ranked amongst some of the world's most endangered indigenous groups. Maureen Lines, an Englishwoman and now a Pakistani national has spent nearly thirty years living amongst these people, learning their language and adopting their ways. As a social worker and author of three books on Kalash she is a leading authority on their culture. On a late Sunday afternoon while sipping tea at her residence in Peshawar I broached the subject of folklore and superstition in Kalash. 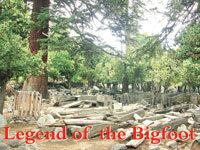 She narrated a curious legend about 'Barmanu' or the 'Bigfoot' of the mountains often sighted in that region. It was fascinating to learn about the existence of a local legend which seemed similar to the stories of the supposed 'Yeti' or Bigfoot of Tibet one hears about so often. Moreover, the story of Barmanu is also related to the legend of 'Beauty and the Beast'. According to the Kalash, Barmanu loves beautiful women! She believes many other groups or societies have this myth. Although this story is widespread in the Northern Areas of Pakistan, but it is particularly centred on the Shishi Kuh region in the Kalash Valleys, she points out. The legend goes that high in the mountains of Kalash area there lives a wild creature that is half-man and half-ape. The Kalash shepherds and their Nuristani neighbours refer to this being as Barmanu in their local dialect. This term is likely derived from the term Ban-Manus in Sanskrit, meaning 'Man of the Forest'. There have been occasional sightings of the mysterious beast and many including Maureen Lines claim to have heard its cry. 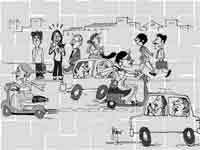 (This fact was confirmed to me separately by her long Chitrali driver Shortfall, who had also heard it). "It was no ordinary cry. It was extremely loud," Maureen says. She recalls the day she was taking a walk with her driver and a local friend when she heard it. "It came from across the river it seemed and it was like a woman's scream but it was definitely animal-like, like somebody was in great agony", according to her. It lasted for a few seconds and the sound echoed and reverberated in the valleys for a while. It was close to nightfall and her companions became frightened and they hastily moved out of the area. Having lived in the Kalash Valley for nearly three decades Maureen reckons there is no known animal, to her knowledge at least, that could make a sound like that. "The hyenas, jackals, mountain lions, even the elusive snow leopard of Kalash region all have distinctive calls. This was beastly & clearly different. And I still shudder every time I think about the experience", Maureen confesses. Experiences like the one mentioned above, sometimes go beyond the realm of plain legends and it is often difficult to find a rational explanation. What follows is even more bizarre. In 1987, a researcher Jordi Magraner, a Spanish scientist living in France arrived in the Kalash valleys in search of the Barmanu. After his initial interviews with locals based upon a 19 month study, he was convinced of the presence of a 'wild hairy man' and the Spaniard spent the next fifteen years in pursuit to find one. Shockingly, in the summer of 2002 he was found dead with a slit throat; murdered in his own house in Kalash Valley. A police investigation lasting two years was inconclusive as they could neither unearth any motive for the murder nor apprehend any accused. He spent many years of his life studying language, origin of the European and Central Asian Neanderthals (Pre-Historic Man). He had a special interest in crypto zoology, an obscure form of science dealing with subjects such as unknown creatures, Loch Ness monsters (a creature said to live in Loch Ness, a deep freshwater loch) and 'Bigfoot' legends. During the period 1988-1990, Jordi Magraner conducted a study on scientific lines with his colleagues Yannik and Erik L'Homme on behalf of Association Trogloydes, France. During his exploration in District Chitral he gathered 27 eyewitness accounts of different encounters with the 'Unknown Hominid of North Pakistan'. He published a paper in the mid-90s which describes the findings of his 1988-1990 study in Pakistan. He records, "We have 27 stories in our possession... In all, 29 people have witnessed 31 contacts with wild hairy men." The anatomic description of the Barmanu given by him is quite vivid: Systematically, the oral statements stress the human appearance, permanent bipedalism and abundant pilosity (hair) on the body except on the face and knees, presence of hands and feet. Lastly, the witnesses spoke about an unpleasant body odour like that of carrion. The head is voluminous, elongated and hunched into the shoulders, with prominent cheekbones, the face is hairless, and the nape is vigorous. The nose is turned up, nostrils are broad...the eyes are wide set, the mouth without lips is broad...The witnesses indicate the lack of forehead and large but human teeth (no large canine teeth like fangs). The chin is not evident". A recent trip to the Kalash Valley gave me an opportunity to meet with different folks who confirmed all the stories about the legend. 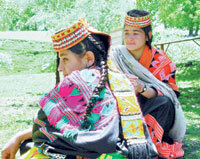 The Kalash tribe particularly believed in the existence of Barmanu. Such a wide held notion, as corroborated by Jordi Magraner's research cannot be easily brushed aside as mere hoax, folklore, or misidentification of other species. Although one might notice that mental dysfunctions like Schizophrenia and hallucinogenic substance abuse appear to be equally common here, yet how does one account for the experiences narrated by visitors as well? I was unable to find any explanation. I visited the house where Jordi Magraner was found murdered in the Bumboret Valley of Kalash and met with those who had personally known him. There are conflicting accounts of the circumstances and the real reason behind his murder. A twelve-year-old boy was reportedly killed simultaneously at his house and his Afghan guide, a prime suspect was missing. One can only make a guess as to the actual motive. Rumour has it that he had formed an intelligence nexus with the slain Mujahideen leader, Ahmad Shah Masood during the Russian invasion of Afghanistan. During the war he would often cross over to the Panjshir Valley lying on the other side of the Hindu Kush. Therefore, one version lays the blame of his murder squarely on Taliban, post 9/11. Some believe he was a 'foreign secret agent' and a few weeks before his death he had been asked by the government to leave. Another person spoke of his irate temper and his frequent quarrelling with his domestic servants who were mostly Afghans. Yet another view gives a completely different angle. Given that he was single and was often seen in the company of young good-looking boys at his home, the local Muslims and Kalasha alike viewed the 'illicit' relationship with suspicion and it is possible they found this behaviour in conflict with their own moral and social norms. Be that as it may, the murder did not receive media publicity at the time. Apart from a few odd reports appearing in the inside pages of national dailies the affair soon mellowed down. I was told Magraner was given a traditional Kalash funeral that lasted three days and his body was interred in a Kalash burial ground in village Krakaal. I sought help in locating his grave from Subhan, a friendly young man who incidentally is the first MBA student from the region. He accompanied me to his burial place by the riverside. The grave is located near the base of a giant juniper tree. It is completely flat and enclosed by a rectangular wooden enclosure. Yet another twist to the mystery was added later, according to Subhan, when within a week of his burial, a foreigner, who introduced himself as a 'personal friend' arrived in the valley from overseas. He had his body exhumed, and photographed the remains at length, before vanishing without a trace. A few months later his family members also paid a visit to the grave. On the last leg of my trip, I paused briefly to pay my final respects to an extraordinary man who had pursued a hill-legend for fifteen years with such serious passion. Now who will carry on Jordi Magrener's labour after his gruesome murder? That remains to be seen. 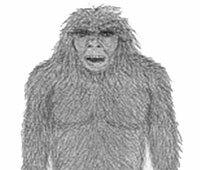 Although the researcher is no longer in our midst, but the fascinating legend of the 'Bigfoot' of Northern Pakistan lives on. I was dropped at the hotel to rest for a few hours before we left for Chandigarh. The two Singaporean delegates who had arrived a few hours later also accompanied me. During the journey we stopped at a 'chai khana' where people were casually reclining on 'charpais' and dumped on plastic chairs. After downing a 'karak daar' glass of chai, we carried on our travel to Chandigarh. Poverty in India is very apparent. As a friend Sahaj, Indian by origin residing in Los.Angeles, said: "At 23, I find that India appears to be progressing but what has not changed is the trenches kind of poverty...the kind where there is no clean running water, poor-young-dark skinned children beg you for money". Part of my journey included the field day trip to Kurukshetra, a village near Chandigarh. The name literally means 'Land of the Kaurava' after the Kuru clan. It is supposed to be the site of the Kurukshetra war, described in the Mahabharata. It is of great importance in Hinduism as this is where the Bhagavad Gita was taught to Arjuna on the battle field, just before the great battle. We were taken to see the youth centres set up there and how efforts were made towards youth development. An ambitious village woman, head of the local youth centre, sounded determined to bring about a change in the minds of people of her society. We discussed issues such as the problem of aborting female foetuses that has resulted in an imbalance in the gender ratio. I found their villages similar to ours with people just as hospitable, and friendly. We were greeted with fervour, with dhol walas beating with enthusiasm and loaded with garlands of marigold flowers. They marked our foreheads with red 'tilaks' the short ritual was ended by popping, from what I remember, 'saunf' in our mouths. The females were presented with ethnic 'dupattas' and the males with 'puggrees'. Everyone was fascinated by our multicultural group and wanted to know how each one of us felt being in India. We went to two more villages and were once again greeted in the same traditional manner.. The same day we were taken to the local 'mandir' in the village. School children climbed and perched themselves on the boundary wall and watched wide eyed as they seemed amused with such a kaleidoscopic gathering at their mandar. Each country delegate was asked to plant a tree that would be named after their respective country. At the end of our visit to Chandigarh I travelled back to Delhi by Shadabdi train I longed to stay a little longer to explore more of India. After some quick shopping I was supposed to report at the airport. At the airport, I was not allowed to board the plane because the police registration stamp was missing. I first felt as if my wish had been granted, but the next few days were full of stress as the police stamp was being arranged, my visa was going to expire and then there was no seat available on the flights to Pakistan. James Michener, a colleague, said "If you reject the food, ignore the customs, fear the religion and avoid the people, you might better stay home". On this short trip I was able to meet Indians from all backgrounds and I got the chance to interact with the common man rather than sit in air-conditioned conference rooms. What I learned from this trip was that people are usually wrong about other countries, especially those countries with whom the relations are not normal.